SEATTLE – Deaths from infectious diseases have declined overall in the United States over the past three decades. 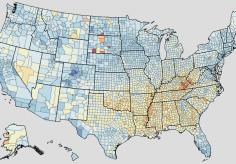 However, the rates of decline varied significantly by counties, according to a new scientific study. The number of deaths attributed to diarrheal diseases has increased substantially as well. While that number is relatively small (about 8,000), diarrhea-related deaths increased in nearly all counties from 1980 to 2014 and were ranked the second-leading cause of all infectious disease mortality behind lower respiratory infections (LRIs) such as pneumonia and bronchitis. LRI-related deaths accounted for more than three-quarters of all infectious disease deaths in 2014. A substantial proportion of those is likely due to the effects of an aging population. Numerous counties within a corridor of states between Missouri and Maine were among the highest in the nation in 2014 for diarrhea-related deaths, with rates nearly 4 per 100,000 people. Nationally, the death rate from infectious diseases decreased about 19%, from 42 to 34 deaths per 100,000 people, from 1980 to 2014. Six major infectious disease groups were included in this analysis and each accounted for at least 1% of all deaths from infectious diseases nationally from 1980 to 2014. In addition to LRI, diarrheal diseases, and HIV/AIDS, these groups were hepatitis, meningitis, and tuberculosis. Deaths from chronic hepatitis B and chronic hepatitis C were excluded from the hepatitis grouping.